When a visitor to your site is logged in to Facebook, the Activity Feed plug-in is personalized with content from that user’s friends. 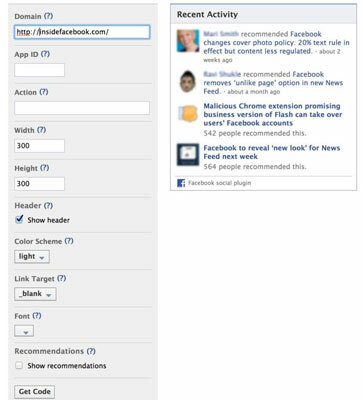 It shows the content within your site that the visitor’s friends are sharing, recommending, and commenting on. If the user isn’t logged in, however, it shows general recommendations from your site, not personalized ones. Visit Facebook’s Plug-ins Page and click the Activity Feed button. Domain: Enter the domain of the page where you plan to put the plug-in. Width: Enter the width, in pixels, of the plug-in. Height: Enter the height, in pixels, of the plug-in. Header: Select the Show Header check box if you want to include the Recent Activity header on the plug-in. Color Scheme: Select your color scheme (you can choose between Light and Dark). Link Target: Select how you’d like the link to open. By default, links open in a new browser window (_blank). However, if you want the content links to open in the same browser window, select _top or _parent. Font: Select the font that you want to appear within the plug-in. Recommendations: If you select the Recommendations check box, the plug-in displays recommendations in the bottom half of the plug-in when you don’t have enough activity to fill the entire box. If the box isn’t selected, no recommendations are shown. Always select the check box so it looks like your Page is active, even when you may be experiencing a slow activity period. Click Get Code to generate the code.